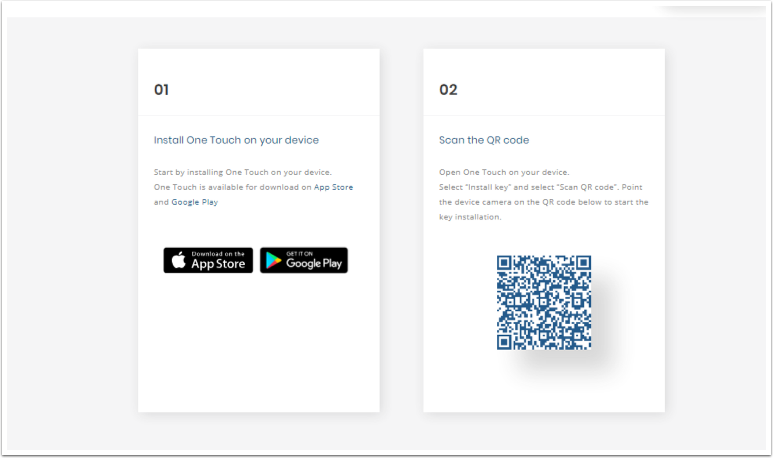 PhenixID One Touch Enrollment allow users to activate themselves for strong authentication with one-time password (OTP), using PhenixID One Touch application. The activation portal reduces user interaction to an absolute minimum. Start the guide by clicking the '+' sign next to One Touch Enrollment. You navigate the guide using the previous and next buttons at the bottom of the page. You can also choose to cancel the guide at any time (information entered will be lost). 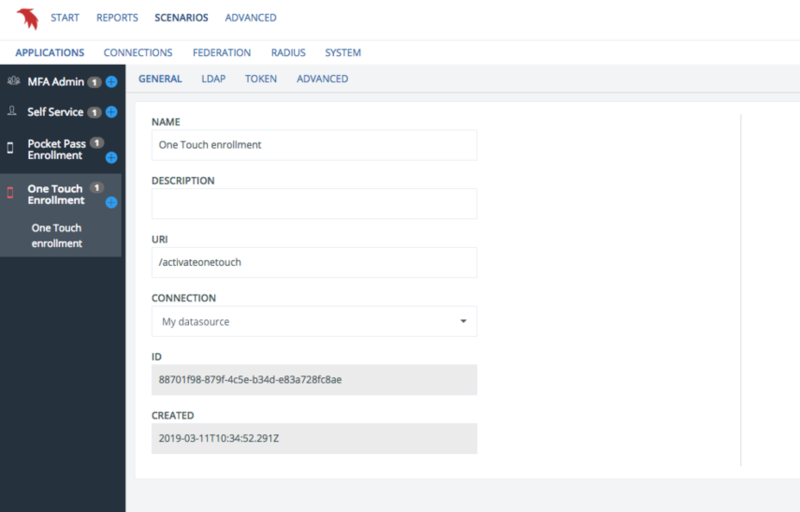 Select an existing connection to an LDAP user store or create a new connection. To create a new connection, follow the steps in the LDAP connection guide. Manually enter the search base to use or select it by using Choose . Search base is the starting point in the directory tree structure from where searches are made. Search is done with scope "SUB". This value is mandatory with LDAP DN as required syntax. Also enter the attribute identifying your users (like uid, mail or samaccountname). Use device push notifications enables support for sending push notifications to mobile devices. Used for notifying users of pending assignments. The activation portal can now be found at the URI displayed below. Log in to the portal with username and password against the user store. Multifactor authentication can be added to the login scenarion. When logged in, enrollment can be made for One Touch profile(s). 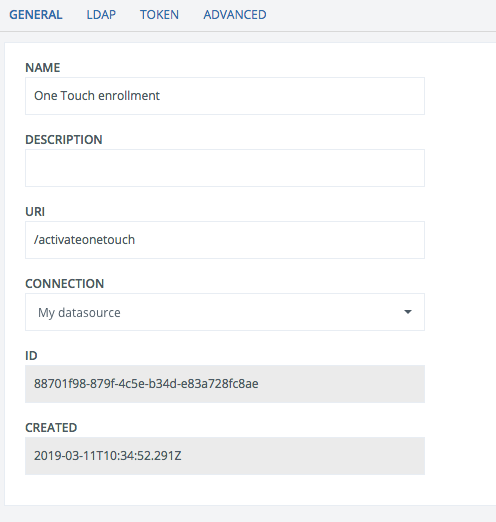 You can edit and delete your one touch enrollment configuration by selecting it in the lefthand menu. When you click save, the configuration will be updated and the server will instantly restart affected components to apply your changes. Delete removes all configuration created by the guide but not shared components (i.e components that could be used by other configurations like connections). Name: Logical name of application (displayed in left side menu). Connection: User store connection. To add a new connection, use the LDAP connection guide and then choose the new connection. Base DN: DN to use as base for user search. Add manually or use Choose to browse your directory. User identifier attribute: Attribute identifying users. Used for bind during login and visible in application. Use device push notifications: Use push notifications. 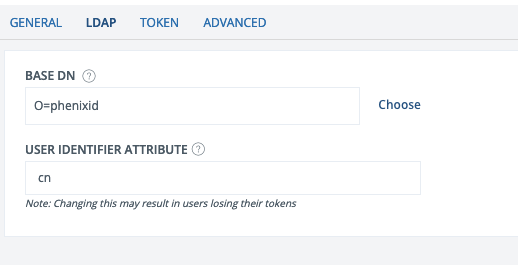 Maximum number of allowed tokens: Limit the number of tokens a user can enroll. Leave blank for unlimited number. HTTP configuration: The HTTP configuration to use. If needed, new configurations can be added under the Connections menu.